Lobelia is one of my favorite plants to grow each summer. I am head over heals in love with it. I planted a six pack of them in this basket a few weeks ago and they just keep blooming and blooming. If growing by seed indoors, start plants 10 weeks prior to last frost date for your area. Can be a little difficult to grow from seed though, so most gardeners buy in 6 packs from the local garden center. Plant in full sun to part shade. In hotter regions, less sun is preferred to keep them blooming longer. Grows 8 to 10 inches in height. Lobelia is grown as a tender perennial in zones 10-11, but as an annual from zones 2-9. 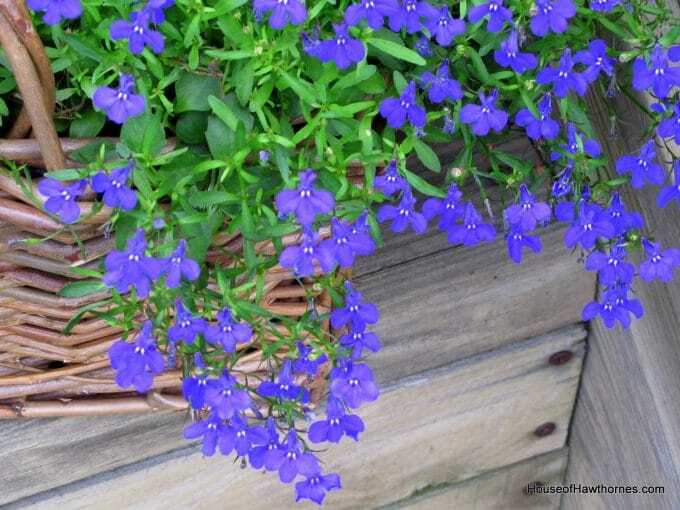 Although they come in other colors, the blue and violet colors of lobelia are the most popular. Lobelia is generally a low maintenance plant. Keep plants well watered especially during the mid-summer heat. Cutting back the plants after the first initial batch of blooms have faded will promote additional flowers. You can fertilize with an all-purpose liquid fertilizer ever 3-4 weeks, but it is not absolutely necessary. They look great planted in the ground or in a container. The trailing nature of this lobelia would make it PERFECT for a hanging basket. Lobelia erinus (edging lobelia) is the type I have grown most often and produce these vibrant flowers. These are the ones you most often see in the garden centers. I’ve also tried the newer heat resistant lobelia and tend to stand up to the intense dead of summer heat quite well (I talk about the Techno Heat Lobelia in my post on Container Gardening Made Easy). If you’ve not tried growing lobelia before, you really need to give it a go this summer. You won’t regret it! Very pretty!!! I had some white lobelia in a pot that I planted a month or so ago with some pink double impatiens, but for some reason the lobelia died. I don’t know why; it usually does really well. I love the vivid color of your blues! I love the way they are falling over the side of your basket. It’s very pretty, Pam. Beautiful. A lovely little surprise. Beautiful basket of blooms! I did these a couple of years ago and loved them! I found mine at a new green house just south of town, but had not seen them at walmart before! I need to do them again. This was the first year I had it too…mine is wilting away though from the heat. Yours is so pretty Pam! I love lobelia too. The wonderful bright blue of the flowers is just great! I love the perky bright blue color. I seem to kill it quickly however. Probably water it too much. 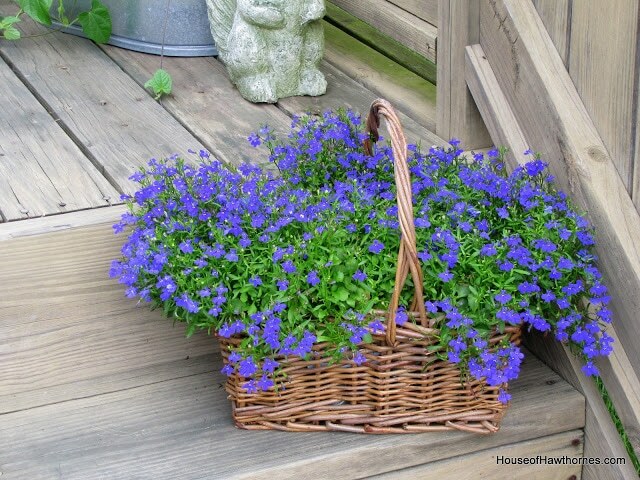 OH the lobelia is lovely in the basket! I’ve never thought of planting things in a basket like that…so charming! 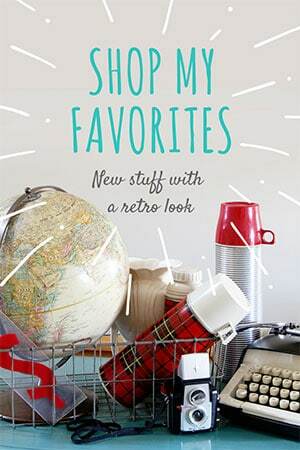 Thanks for posting my giveaway on your sidebar! I love lobelia! I really like how you have them in a basket. I have always planted them with other flowers in my urns. I think I will copy your idea. They are stunning all alone! Pretty Pam. I think blue flowers are something special. 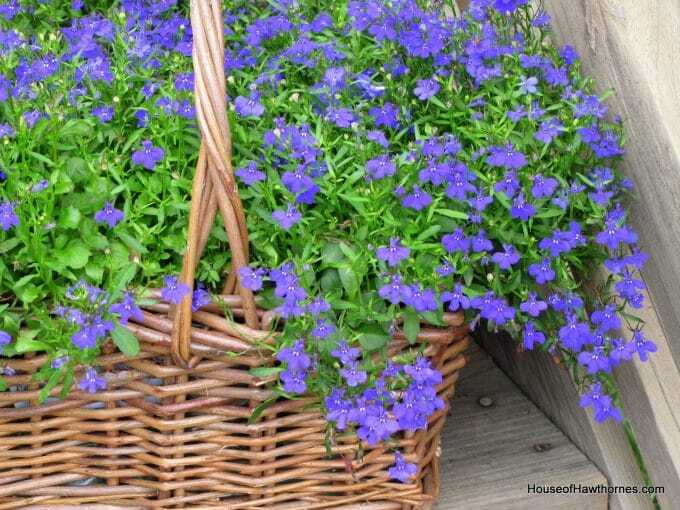 I absolutely love your lobelia basket. I’ve never used it before but did see some at the garden center last week. I may just have to go back and see if any is left. Love how it spills over the basket. It looks so inviting on the steps. I love that you planted them in the basket! So pretty. SO pretty! 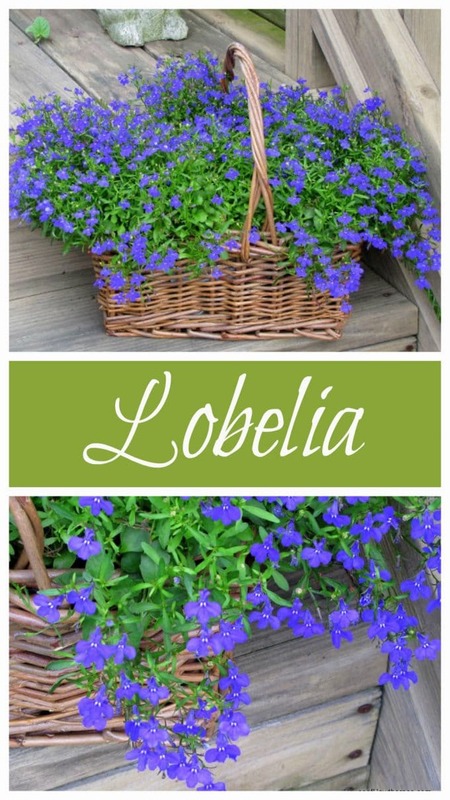 I’ve always seen lobelia in hanging baskets, but never tried it either. And I do LOVE any blue flowers! Let us know how it does the rest of the summer. I’ll have to remember it for next year! Love your basket. Our color theme on the porch is red yellow and blue, Lobelia works so well in our porch boxes. It’s a must for every garden…a great pop of blue. How pretty! Love the color of the Lobelia. Looks great in a basket. What a vivid shade of color they are… love it! I love Lobelia too, especially the trailing lobelia for baskets and hanging planters. I always try to put them in transportable containers so when it gets too hot for them I can keep them in a shadier location and they last all summer. 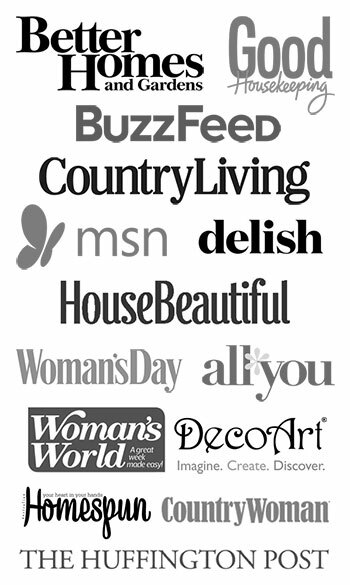 On another not, I love the font in your Header, could you tell me what it is? Hey Pam, I love lobelias but I have had no success with them. Temperatures here get as high as 39 degrees. I am totally in awe at yours . You must have grown from seedlings ? I have tried from seeds ? Any advice for me ? I have not grown from seed before Mary, I normally pick up the little cell packs at the local nursery. I have heard from other gardening friends that they do grow easily from seeds, but most people agree that they don’t like to dry out in the heat of the summer, so keep them watered. I normally grow it in a container (basket,hanging basket or something like that, so I’m watering it daily anyhow). I just bought this plant. I put it in a hanging container with white trailer. Should be Really pretty together. Can’t wait until it gets bigger. I love it also. Lobelia is gorgeous ,if you can keep it alive through the summer ,. Never had luck with it . They have a new variety called Techno Heat lobelia and I just planted some for the first time this year. It’s supposed to take the mid-summer heat much better than the traditional variety. A friend in North Carolina planted it last year and she said it flowered all summer long so I thought I’d give it a try this year!